Boost traffic and engagement to your website/ E- store front by installing the AddThis App. 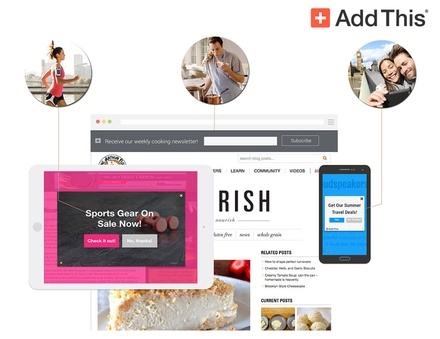 With AddThis, your users can easily share your content to over the most popular social networking and bookmarking sites, including Facebook, Twitter, and Pinterest. AddThis is used on over 12 million domains worldwide, supports over 70 languages, is quick to load and recognized across the web. The optimized tools measure engagement and on page actions including sharing, text being copied, address bar sharing, and visitors following your social channels all in a powerful and easy to use real-time analytics dashboard. Share Buttons : Increase brand awareness and drive additional traffic by allowing site visitors to distribute your content across a variety of social networks. Follow Buttons : Grow your community through beautiful and easy-to-use buttons placed on your website. Targeting Tools : Get more email signups, subscriptions, registrations and more with the use of customizable and targeted promotion tools. Increase the accuracy and reach in your digital marketing with AddThis audience solutions. Brands and agencies can access our robust off-the-shelf audiences and on-demand custom audiences to improve marketing effectiveness and ROI.